FPGA’s are associated with a fair amount of design complexity. 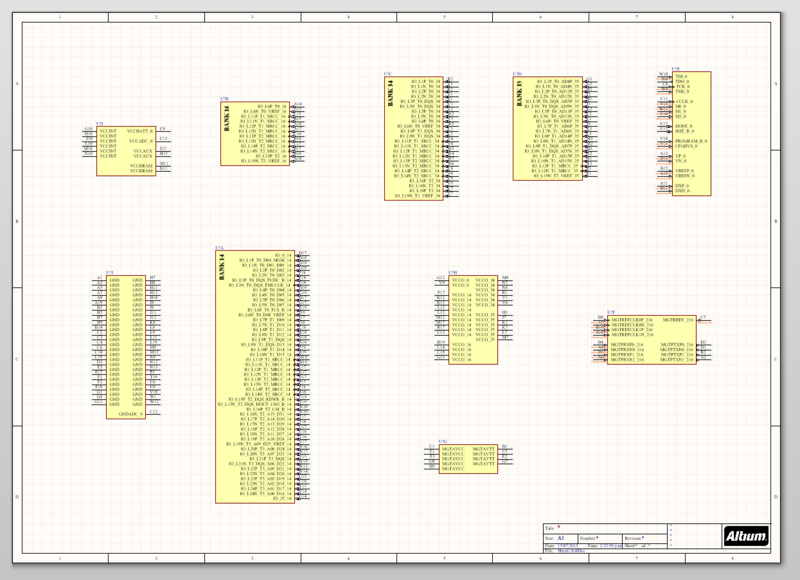 Below is an A3-sized schematic sheet with JUST one 236-pin FPGA component added to it (no actual routing). An A3 schematic sheet with just one 236-pin FPGA IC added to it (no routing). Typically, FPGAs require a large number different voltages to operate. This makes PSU design an important step in the FPGA design process. Most of these voltages are quite low. For example, an FPGA could require 1.0V, 1.2V, 1.8V and 3.3V to operate. They also place tight restraints on the power-up/power-down sequence of these voltage rails. Because the data that configures (the bitstream) an FPGA is stored in CMOS configuration latches (CCL’s), Xilinx FPGA’s loose their configuration everytime they are powered down.